The name comes from Las sergas de Espladi�n (Adventures of Spladian), a 16th century novel, by Garci Rodr�guez de Montalvo, where there is an island paradise called California. The connection of the far Pacific West to the eastern population centers came in 1869 with the completion of the first transcontinental railroad. Out West, residents were discovering that California was extremely well suited to fruit cultivation and agriculture in general. Citrus, oranges in particular, were widely grown, and the foundation was laid for the state's prodigious agricultural production of today. The Governor of California and the other state constitutional officers serve four-year terms and may be reelected only once. The California State Legislature consists of a 40 member Senate and 80 member Assembly. Senators serve four year terms and Assembly members two. The terms of the Senators are staggered so that half the membership is elected every two years. The Senators representing the odd-numbered districts are elected in years evenly divisible by four, i.e., presidential election years. The Senators from the even-numbered districts are elected in the intervening even-numbered years, in the gubernatorial election cycle. For the 2003-2004 session, there are 48 Democrats and 32 Republicans in the Assembly. In the Senate, there are 25 Democrats and 15 Republicans. The current Governor is Republican Arnold Schwarzenegger, whose current term lasts through January 2007. Schwarzenegger was only the second person in the history of the United States to be put into office by a recall of a sitting Governor. Schwarzenegger replaced Governor Gray Davis (1999-2003) who was removed from office by the October 2003 California recall election. At the national level, California is represented by two senators and 53 representatives. It has 55 electoral votes in the U.S. Electoral College. California has the most Congressmen and Presidential Electors of any state. The two U.S. Senators from California are Democrats Dianne Feinstein and Barbara Boxer. Thirty Democrats and 20 Republicans represent the state in the U.S. House of Representatives. 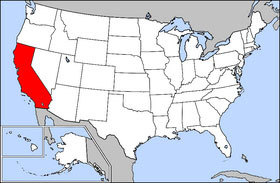 California borders the Pacific Ocean, Oregon, Nevada, Arizona, and the Mexican State of Baja California. The state has striking natural features, including a huge fertile central valley, high mountains, and hot dry deserts. With an area of 410,000 km� it is the third largest state in the U.S. Most major cities cling to the cool, pleasant seacoast along the Pacific, notably San Francisco, San Jose, Los Angeles and San Diego. The capital, however, is Sacramento in the Central Valley. 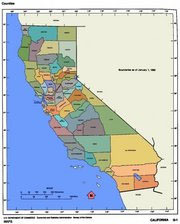 California is famous for its earthquakes due partly to the presence of the San Andreas Fault. While more powerful earthquakes in the United States have occurred in Alaska and along the Mississippi River, California earthquakes are notable due to their frequency and location in highly populated areas. Popular legend has it that, eventually, an earthquake known as "The Big One" will result in the splitting of coastal California from the continent, either to sink into the ocean or form a new landmass. The fact that this scenario is completely implausible from a geologic standpoint does not lessen its acceptance in public conventional wisdom, or its exploitation by the producers of science fiction and fantasy media. Notable movies in which the possible destruction of much of California by an earthquake includes the titles Earthquake, A View to a Kill, and Superman. California is also home to several volcanoes, some active such as Mammoth Mountain. Other volcanoes include Lassen Peak, which erupted from 1914 and 1921. California is responsible for 14% of American gross domestic product, which at nearly $1.4 trillion is greater than that of every country in the world save for the United States, China, Japan, Germany, France and the United Kingdom. According to the census, California lacks a majority ethnic group. Whites are still the largest group, but are no longer a majority of the population. Hispanics make up almost one-third of the population; in order, other groups are Asian Americans, African Americans, and Native Americans. Because of high levels of immigration from Mexico and higher birth rates among the Hispanic population, Hispanics are predicted to become a majority around 2040. The state of California has many cities and the majority of these cities are within one of nine total major metropolitan areas. The four largest are coastal being Los Angeles, San Diego, San Jose, and San Francisco. The other five are inland and consist of the Inland Empire (Riverside-San Bernardino-Ontario), Sacramento, Fresno, Bakersfield, and the Antelope Valley (Palmdale-Lancaster). The California State University system provides education for teachers, the trades, agriculture and industry. With over 400,000 students, the CSU system is the largest university system in the United States. It is intended to accept most college-bound high-school students, while carrying out some research, especially in applied sciences. Lower-division course credits are frequently transferable to the University of California.